The temperatures listed below are taken from the weather station at the centre of the city which is at an elevation of 767 m (2,516 ft) above sea level. At higher elevations, the temperatures will be lower during winter and higher during summer. For example, in areas such as al-Jubaiha, Sweileh, Khalda, and Abu Nser, which are at/higher than 1,000 m (3,300 ft) above sea level have average temperatures of 7 to 9 °C (45 to 48 °F) in the day and 1 to 3 °C (34 to 37 °F) at night in January. In August, the average high temperatures in these areas are 25 to 28 °C (77 to 82 °F) in the day and 14 to 16 °C (57 to 61 °F) at night. The 2009 IAAF World Cross Country Championships took place on March 28, 2009. The races were held at the Al Bisharat Golf Course in Amman, Jordan. Four races took place, one for men, women, junior men and junior women respectively. All races encompassed both individual and team competition. Amman is also only the second occasion on which Asia has hosted the World Cross Country Championships, which are the oldest IAAF World Athletics Series event, first celebrated under the IAAF banner in 1973. The 2018 AFC Women's Asian Cup was the 19th edition of the AFC Women's Asian Cup, the quadrennial international football tournament in Asia competed by the women's national teams in the Asian Football Confederation (AFC). It was originally scheduled to be held in Jordan between 7 and 22 April 2018, but later was changed to 6 to 20 April 2018.The tournament served as the final stage of Asian qualification for the 2019 FIFA Women's World Cup, with the top five teams qualifying for the World Cup in France.Japan defeated Australia 1–0 in the final to win their second consecutive title. In the third-place match the same day, China defeated Thailand 3–1. Al-Faisaly Sports Club (Arabic: نادي الفيصلي الرياضي‎) is a football club based in Jordan, formed in Amman in 1932, which is also considered as the most successful football club in Jordan's history and the only club to win 77 trophies, it's also considered as one of the most successful in the region, winning Jordanian football club tournaments, the Jordan League, Jordan FA Cup, Jordan FA Shield, Jordan Super Cup and AFC Cup multiple times. Their current competitive or rival team is Al-Wehdat, a club formed by a Palestinian refugee camp in Amman which is also one of the best clubs in the country, winning local tournaments as many times as their rival team Al-Faisaly. Al-Jazeera Club (Arabic: نادي الجزيرة‎) is a Jordanian football club based in Amman. Founded in 1947, the team plays at Amman International Stadium. The Amman International Stadium (Arabic: ستاد عمان الدولي‎) is a stadium in Al Hussein Youth City in Amman, Jordan. It is the largest stadium in Jordan. The stadium was built in 1964 and opened in 1968, it is owned by the Jordanian government and operated by the higher council of youth. It is also the home stadium of the Jordan national football team and Al-Faisaly SC. It has a current capacity of 55,619 spectators. Annur is a town panchayat and taluk headquarters of Annur Taluk of Coimbatore district. It is a suburb of Coimbatore city located north-east about 30 kilometres (19 miles) from the center of the city. Nearest airport is Coimbatore International Airport, which is about 27 kilometres (17 miles) and the nearest railway station is Coimbatore Central, which is about 30 kilometres (19 miles) away. Other cities/towns nearby Annur are Mettupalayam, which is 21 kilometres (13 miles) away in the west, Avanashi, which is 18 kilometres (11 miles) away in the east and Punjai Puliampatti, which is about 18 kilometres (11 miles) in the north.Annur has police station with Karumathampatti sub division. The Umayyad desert castles, of which the desert castles of Jordan represent a prominent part, are fortified palaces or castles in what was the then Umayyad province of Bilad ash-Sham. Most Umayyad "desert castles" are scattered over the semi-arid regions of north-eastern Jordan, with several more in Syria, Israel and the West Bank (Palestine). Jordan (Arabic: الْأُرْدُنّ‎ Al-ʾUrdunn [al.ʔur.dunː]), officially the Hashemite Kingdom of Jordan (Arabic: المملكة الأردنية الهاشمية‎ Al-Mamlakah Al-Urdunnīyah Al-Hāshimīyah), is an Arab country in Western Asia, on the East Bank of the Jordan River. Jordan is bordered by Saudi Arabia to the south, Iraq to the north-east, Syria to the north and Israel and Palestine (West Bank) to the west. The Dead Sea is located along its western borders and the country has a small coastline to the Red Sea in its extreme south-west, but is otherwise landlocked. Jordan is strategically located at the crossroads of Asia, Africa and Europe. 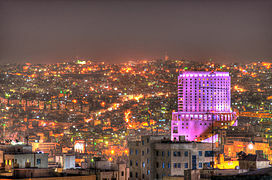 The capital, Amman, is Jordan's most populous city as well as the country's economic, political and cultural centre.What is now Jordan has been inhabited by humans since the Paleolithic period. Three stable kingdoms emerged there at the end of the Bronze Age: Ammon, Moab and Edom. Later rulers include the Nabataean Kingdom, the Roman Empire, and the Ottoman Empire. After the Great Arab Revolt against the Ottomans in 1916 during World War I, the Ottoman Empire was partitioned by Britain and France. The Emirate of Transjordan was established in 1921 by the Hashemite, then Emir, Abdullah I, and the emirate became a British protectorate. In 1946, Jordan became an independent state officially known as the Hashemite Kingdom of Transjordan, but was renamed in 1949 to the Hashemite Kingdom of Jordan after the country captured the West Bank during the 1948 Arab–Israeli War and annexed it until it was lost to Israel in 1967. Jordan renounced its claim to the territory in 1988, and became one of two Arab states to sign a peace treaty with Israel in 1994. Jordan is a founding member of the Arab League and the Organisation of Islamic Co-operation. The sovereign state is a constitutional monarchy, but the king holds wide executive and legislative powers. Jordan is a relatively small, semi-arid, almost landlocked country with an area of 89,342 km2 (34,495 sq mi) and a population numbering 10 million, making it the 11th-most populous Arab country. Sunni Islam, practiced by around 95% of the population, is the dominant religion in Jordan and coexists with an indigenous Christian minority. Jordan has been repeatedly referred to as an "oasis of stability" in a turbulent region. It has been mostly unscathed by the violence that swept the region following the Arab Spring in 2010. From as early as 1948, Jordan has accepted refugees from multiple neighbouring countries in conflict. An estimated 2.1 million Palestinian and 1.4 million Syrian refugees are present in Jordan as of a 2015 census. The kingdom is also a refuge to thousands of Iraqi Christians fleeing persecution by ISIL. While Jordan continues to accept refugees, the recent large influx from Syria placed substantial strain on national resources and infrastructure.Jordan is classified as a country of "high human development" with an "upper middle income" economy. The Jordanian economy, one of the smallest economies in the region, is attractive to foreign investors based upon a skilled workforce. The country is a major tourist destination, also attracting medical tourism due to its well developed health sector. Nonetheless, a lack of natural resources, large flow of refugees and regional turmoil have hampered economic growth. Jordanian art has a very ancient history. Some of the earliest figurines, found at Aïn Ghazal, near Amman, have been dated to the Neolithic period. A distinct Jordanian aesthetic in art and architecture emerged as part of a broader Islamic art tradition which flourished from the 7th-century. Traditional art and craft is vested in material culture including mosaics, ceramics, weaving, silver work, music, glass-blowing and calligraphy. The rise of colonialism in North Africa and the Middle East, led to a dilution of traditional aesthetics. In the early 20th-century, following the creation of the independent nation of Jordan, a contemporary Jordanian art movement emerged and began to search for a distinctly Jordanian art aesthetic that combined both tradition and contemporary art forms. The Kamakshi Temple is an ancient Hindu Temple dedicated to Kamakshi, the ultimate form of Goddess Lalitha Maha Tripurasundari(Parvati). It is located in the historic city of Kanchipuram, near Chennai, India. The Meenakshi Temple in Madurai, the Akilandeswari temple in Thiruvanaikaval near Tiruchirappalli and this Kamakshi temple are the important centers of worship of Goddess, in the state of Tamil Nadu. The Temple was most probably built by the Pallava kings, whose capital was Kanchipuram. The Image of the main Deity, Kamakshi, is seated in a majestic Padmasana, a yogic posture signifying peace and prosperity, instead of the traditional standing pose. Goddess holds a sugarcane bow and bunch of five flowers in the lower two of her arms and has a pasha (lasso), an ankusha (goad) in her upper two arms. There is also a parrot perched near the flower bunch. There are no other Goddesss temples in the city of Kanchipuram, apart from this temple, which is unusual in a traditional city that has hundreds of traditional temples. There are various legends that account for this fact. Adi Shankaracharya, the famous 8th century CE scholar and saint, re-established the Sri Chakra in this Kamakshi Devi temple in the trough-like structure in that shrine. Periapalayam is a village about 40 km north of Chennai, in Tiruvallur district, Tamil Nadu State, India. It is in Ellapuram block which stretches from east Thanakulam village, west Uthukottai, north Kosavanpettai and in the south up to Komakambedu village. It has one of the main routes to Andhra Pradesh. The town is famous for the Sri Bhavani Amman Temple. This temple is located on the Arani river flowing through the town. The temple attracts thousands of people during the Tamil months of Adi and Avani especially during the weekends. .
Shanmugalingam Sivashankar (Tamil: சண்முகலிங்கம் சிவசங்கரன்; 1962 – 18 May 2009; commonly known by the nom de guerre Pottu Amman) was a Sri Lankan Tamil rebel and leading member of the Liberation Tigers of Tamil Eelam, a separatist Tamil militant organisation in Sri Lanka. Queen Alia International Airport (IATA: AMM, ICAO: OJAI) (Arabic: مطار الملكة علياء الدولي‎; transliterated: Matar Al-Malikah Alia Ad-Dowali) is Jordan's main and largest airport and is located in Zizya 30 kilometres (20 mi) south of the capital city, Amman. It is named after Queen Alia, who died in a helicopter crash in 1977. The airport is home to the country's national flag carrier, Royal Jordanian Airlines and serves as a major hub for Jordan Aviation. A state-of-the-art new terminal was inaugurated in March 2013 to replace the airport's older two passenger terminals and one cargo terminal. The three original terminals were made obsolete once the new terminal officially began operations. In 2014, the new airport received the "Best Improvement by Region: Middle East" and "Best Airport by Region: Middle East" awards by the Airport Council International. The awards are given to the airports which achieved the highest customer satisfaction in the ASQ Survey. The Children's Museum Jordan (Arabic: متحف الاطفال الاردن) is a children's museum in Amman, Jordan. It is located in Al Hussein Public Parks. Launched in 2007, the museum is a member of the Association of Children's Museums and Hands On! International. The Museum’s total build area of 7,348 square meters includes: 150 interactive indoor and outdoor exhibits, an art studio, a library, a multipurpose hall, an outdoor theatre, a restaurant with an adjunct party room and a gift shop. On standby are additional spaces with potential for development, such as the exhibit hall extension, a botanical garden annex or the special effects auditorium. Vinayagamoorthy Muralitharan (nom de guerre: Colonel Karuna Amman; Tamil: விநாயகமூர்த்தி முரளிதரன், born 1966) is a Sri Lankan politician and former militant. After fighting for the Liberation Tigers of Tamil Eelam for over 20 years, he rose to prominence as the leader of the Tamil Makkal Viduthalai Pulikal (TMVP), a breakaway faction of the LTTE. After giving up arms and entering politics, he was appointed as a National List Member of Parliament for the ruling United People's Freedom Alliance (UPFA), the party of President Mahinda Rajapakse, in 2008 and sworn in as Minister of National Integration on March 9, 2009. He later joined the Sri Lanka Freedom Party, the largest party in the UPFA, and on April 24, 2009 he appointed a Vice President of the Sri Lanka Freedom Party.